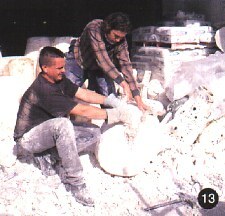 Once cold, the mould is broken open and the raw cast sculpture gradually revealed. 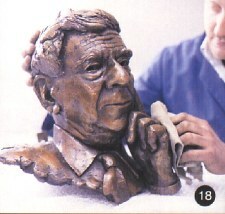 The bronze cast is jet washed to remove all particles of the ceramic mould. 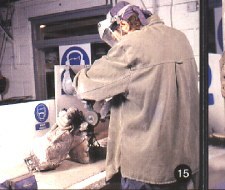 The long and patient task of chasing or metal working the sculpture begins. Cracks that filled with bronze are chiselled off, the runners and risers removed, holes filled with welded metal and texture punched back where relevant. This stage often takes as long again as all the previous stages and calls for good concentration and sensitivity while filing and brazing. The whole sculpture has to be made good, to the same state as the original. 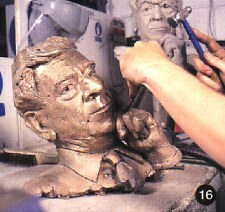 The final process once the chasing is completed, is patination. This is the chemical colouring of the surface of the bronze, using oxidising agents either to oxidise the copper in the bronze or to leave an oxide of another metal bound to the surface of the sculpture. 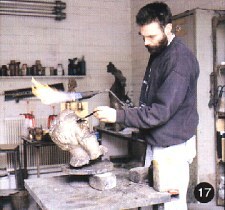 The range of colours is extensive but often varies in detail from one cast to another due to the nature of patination. Some of the more delicate patinations are only suitable for smaller indoor sculpture, and a range of colours that change little or are enhanced by natural environmental chemicals are applied to outdoor pieces. 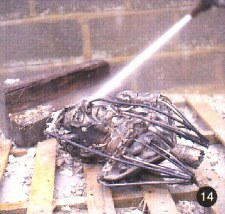 The method is to stipple the chemical onto the metal and then aim a hot flame at that area which bonds the colour. Once the desired colour has been achieved a protective coat of wax is applied to the surface and then buffed up.